are relatively common in sport, especially in Australian football, basketball, netball and alpine skiing. Historically, serious injuries to the ACL have prematurely halted sporting careers. However current surgical and rehabilitation practices enable most athletes with ACL injuries to resume regular sporting activities. The knee is one of the most complex joints in the human body. Being a hinge joint it is structured to perform two principal actions, flexion (bending) and extension (straightening). The muscles which act at the knee are predominantly the quadriceps (extension) and the hamstrings (flexion). The knee is comprised of the bottom end of the femur (thigh) and the upper end of the tibia (shin) and the patella (knee cap). The major ligaments of the knee are the Anterior Cruciate (ACL), the Posterior Cruciate (PCL), and the Medial (MCL) and Lateral (LCL) Collateral Ligaments. These, along with the muscles acting on the knee provide the joint’s stability. The ACL prevents the femur from moving forwards during weight bearing. It also helps to prevent rotation of the joint. Injury of the ACL most often occurs when an athlete is pivoting, decelerating suddenly or landing from a jump. The injury can also be caused by another player falling across the knee. Women are more likely to suffer an ACL injury than men. Participating in training drills that require balance, power and agility. Adding plyometric exercises, such as jumping, and balance drills to help improve neuromuscular conditioning and muscular reactions and decrease the risk of ACL injury. Undergoing an ACL conditioning program. Many team physicians now routinely recommend this for female players. Undertaking preseason training. Plan for at least four weeks of endurance training before sporting seasons, or prior to the ski season. Most athletes who experience a full tear of the ACL describe a loud sound such as a ‘pop’ or ‘crack’. This is often followed by a few minutes of extreme pain. A torn ACL is often accompanied by hemarthrosis (bleeding into the joint space) which may be visible as a large tense swelling of the knee. Examination of the knee is more easily done within the first hour following the injury before the development of hemarthrosis. Presenting for medical assessment as soon as possible after injury is recommended even if significant swelling has occurred. 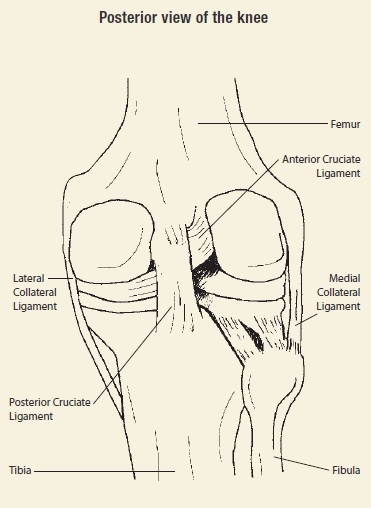 Athletes with a torn ACL often have severe restriction of movement, particularly extension. Other knee injuries such as damage to the meniscus (knee cartilage), and the medial or lateral collateral ligaments may also accompany a torn ACL. The immediate treatment of any soft tissue injury consists of the RICER protocol – rest, ice, compression, elevation and referral. RICE protocol should be followed for 48–72 hours. The aim is to reduce the bleeding and damage within the joint. The knee should be rested in an elevated position with an ice pack applied for 20 minutes every two hours (never apply ice directly to the skin). A correctly sized compression bandage should be applied to limit swelling and bleeding in the joint. A sports medicine professional should be seen as soon as possible to determine the extent of the injury and to provide advice on treatment required. A sports medicine professional may perform a physical examination and take x-rays of the knee. An MRI test may be recommended to confirm the diagnosis. Surgical reconstruction is a very common method used to repair a completely torn ACL. This usually involves replacing the torn ACL. Various factors are considered when deciding on whether to surgically reconstruct a torn ACL. The degree of knee instability. Associated injuries of the knee. Social factors such as cost of treatment and time away from work. The type of sports played by the injured athlete. The age of the athlete. The expected demands to be placed on the knee. Rehabilitation for a reconstructed ACL will be conducted under the direction of an orthopaedic surgeon and the supervision of a physiotherapist. A number of rehabilitation program schedules exist however more recent programs commence with a schedule of protected mobilisation, followed by strengthening activities and ultimately progress to functional exercises. This rehabilitation usually takes between six and nine months. It is recommended that athletes with reconstructed ACL injuries return to sport with the approval of their orthopaedic surgeon. This is usually when strength, range of motion and co-ordination are nearly at full capacity.